Thermal Heat Treatments were originally designed to exterminate dry wood termites. What do termites and bed bugs both have in common? Both pests invade and live inside walls. Bed bugs are not isolated to living just on beds. In an early infestation they will often be found hiding in the box-spring or seams of the bed, but after several weeks they will move into other areas which can include walls. The problem becomes how do you kill the bed bugs in the walls. Thermal heat treatments are the most effective form of eradicating bed bugs in walls and other areas in a home. The heat absorbs into all the items in the home and inside the walls. Once it hits the lethal temperature of over 122 degrees the bed bugs will dehydrate and die in less than a minute. The actual room temperature however needs to be much higher and requires a combination of heat and fast moving air to work efficiently. Heat treatments need to be performed by well trained professionals only! Do not try heating your home by yourself others have and started fires in the home. The process of performing a high quality heat treatment requires many hours of training and the proper use of monitoring equipment, but if you have an infestation that has spread into several areas of your home nothing will work as well. Using high heat to kill bed bugs is the most effective solution available and requires the least preparation and time and will eliminate 100% of the bed bugs in your home. 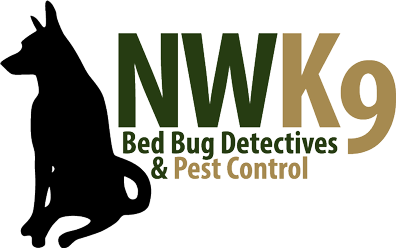 Northwest K9 Bed Bug Detectives offers Thermal Heat Treatments and many other forms of extermination to rid your home of bed bugs once and for all.